But don't let Kolakowski's conversational tone fool you. Beneath it lies a keen strategic and tactical analysis of these two frequently overshadowed campaigns. Kolakowski explains why they were decisive precursors to the more widely known battles that would later open the heartland of the upper South to a relentless tide of blue-coated invaders. The book's first two chapters set the stage for the initial clash between the newly formed Union Army of the Cumberland and the newly named Confederate Army of Tennessee along a clear, limpid stream 30 miles south of Nashville. Both Union Major General William S. Rosecrans and Confederate Lieutenant General Braxton Bragg had the same New Year's Eve 1862 battle plan; hold on the right and turn the other's left flank. Bragg struck first and, for most of the day, the situation looked bleak for the boys in blue. But a makeshift defensive line anchored at a place that aptly became known as “Hell's Half Acre,” and strung out along the Nashville Pike, eventually stemmed the gray tsunami.. The next day, both armies salved their considerable wounds under a cold, driving rain. On the afternoon of Jan. 2, 1863, a poorly planned and disastrously executed Rebel attack on the Federal right at McFadden's Ford against a wall of expertly directed artillery fire ended what was to be the war's bloodiest battle in proportion to the number of troops engaged. 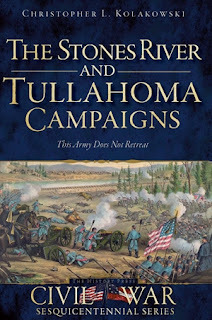 The battle of Stones River reflected the personalities of each army's commander. Rosecrans was at the height of his powers; proud, profane, and personally courageous. Bragg was rigid, aloof, and personally arrogant. Kolakowski rightly characterizes the failings of the Confederate command structure in the West, from Jefferson Davis on down, as a continuous psychodrama that plagued the Rebel armies in the West for the rest of the war. Both armies then went into winter quarters. Bragg, at Tullahoma, spent his time squabbling with his superiors and subordinates while Rosecrans, at Murfreesboro, reinforced and resupplied his battered army. After 169 days of rest, and considerable prodding from Washington, Rosecrans was ready to resume campaigning. 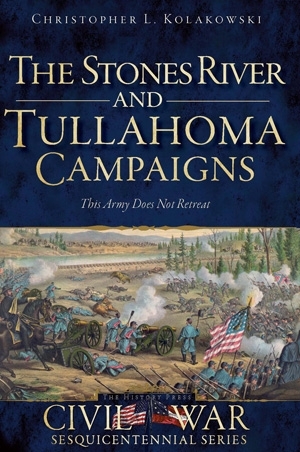 Because of momentous events occurring in other theaters (Lee's invasion of Pennsylvania and Grant's final assault and capture of Vicksburg), the Tullahoma Campaign rarely earns a historiographical footnote. The long blue lines marched out of Murfreesboro on June 24, into “one of the wilder and latest-settled areas in Tennessee.” The roads were bad and the weather was worse. It rained for 14 of the next 17 days, leading one of Rosecrans' brigade commanders to observe “The roads seem to have been lost, as we passed through woods with bottomless mud.” But Rosecrans had two secret weapons, accurate maps and Captain William Emory Merrill to draw them. First in his class at West Point in 1859, Merrill was now in charge of the army's topographical department. He left nothing to chance. Maps produced by his topographical engineers allowed commanders to study the roads leading to the Tennessee River, calculate their capacities and limitations, and pinpoint locations where they could find water and forage. Map making for the Army of the Cumberland had become an integral part of its war making capability. “Rosecrans's conquest of the region,” Kolakowski concludes, “had been amazingly cheap.” At a cost of less than 600 casualties, “The Army of the Cumberland now controlled Middle Tennessee and threatened Chattanooga itself.” The roads to Alabama, Georgia, and East Tennessee were now open.